Fondue is a party favorite but can become a bit of work for the host. This super-simple cheese fondue recipe, however, is made in the crockpot, doing all of the work for you. With all of the cheesy goodness, a little hot pepper kick, and a hint of smokiness, no one will believe that you just assembled the ingredients and let your slow cooker do the rest. You can dip just about anything into this crockpot fondue, but it is ideal with a bit of crusty bread or crunchy vegetables. Place all ingredients in slow cooker. Stir to mix. Cover and cook on low for 2 hours. After 1 hour of cooking time, stir. Before serving, whisk to blend. Serve with ​breadsticks or veggies for dipping. No matter what type of fondue you are serving, there is no reason to limit yourself to bread and vegetables as foods to dip into the warm, cheesy mixture. From crackers and chips to meat and seafood to dried fruit, there are plenty of interesting ingredients that will not only taste great with the flavorful gooey cheese but will also make the platter visually appealing. Think outside the box when choosing breads and vegetables. This fondue recipe would be perfect with a rye, pumpernickel, or multigrain bread, and pairs beautifully with warm, soft pretzels. Cooked Brussels sprouts, fingerling potatoes, and artichoke hearts will complement the cheese dip nicely, as will sausage and chicken. Apples and pears would also be a welcome addition to the fondue tray. Fondue is not only a quintessential dish to serve at a gathering with friends, but could also be a fun meal to serve the family (as long as you accompany the cheese dip with plenty of vegetables and perhaps some protein). Of course, you can go completely classic with a traditional fondue with brandy, or try something a little different. Cheddar cheese and beer fondue mimics the flavors of Welsh rarebit, a British dish of hot cheese on toast, while Italian cheese fondue combines the familiar flavors of mozzarella, fontina, and Parmesan. There are also recipes for vegan cheese fondue, as well as dessert, like crockpot chocolate fondue. Fondue is a Swiss and French cheese and wine recipe that was first published in Zurich around 1700. The process involves rubbing the inside of the fondue pot, called a caquelon, with a clove of garlic, and then heating the wine and cornstarch before adding the grated cheese. It is gently cooked, while stirring, until melted and smooth. Often a bit of kirsch brandy is added at the end. 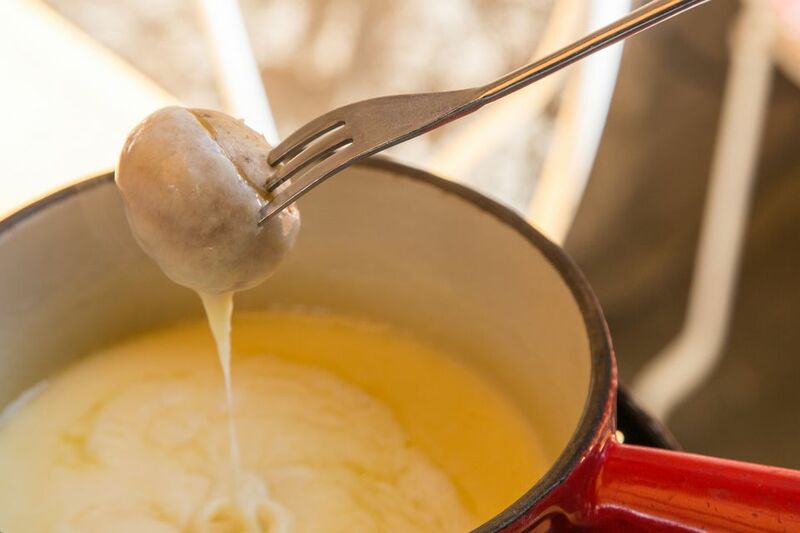 The trickiest part about fondue is keeping it at the right temperature—it needs to stay warm enough to remain the somewhat liquid consistency but cannot get too hot that it will burn. If it is heated properly, there will be a crusty layer of toasted cheese on the bottom of the pot. Diners remove this and eat it like a cracker.